This gel helps to treat acne by unblocking pores and allowing oil producing glands to function as normal, leading to a decrease in the forming of spots and blackheads. It will also shorten the lifespan of skin cells, meaning skin cells are replaced quicker and the skin is fresher and cleaner. Clean your face using clean water and allow 10 to 15 minutes to dry. Squeeze a small amount of gel onto your fingers and spread the gel over the affected areas. Rub the gel into the skin using a circular motion until the gel dries. Wash your hands thoroughly using soap. Please note: Do not use Isotrex Gel after the expiry date which is stated on the tube and carton (after exp). The expiry date refers to the last day of that month. This product should be used within two months of first opening. After two months, discard any unused portion. This product must be used consistently for at least 6 to 8 weeks consistently in order to notice improvements. This is because the gel does not help treat existing spots and blackheads which have already began developing, but instead works to reduce the production of new spots and blackheads. Where can I buy Isotrex online? You can buy Isotrex online with or without a prescription at Medical Specialists, after completing a simple online consultation. Just complete an online consultation by clicking the orange button above. We are the UK’s leading supplier of acne and anti wrinkle treatment online, and for sale in the UK by our pharmacy which is regulated by the Royal Pharmaceutical Society of Great Britain. For full patient information, please read or print out the leaflet provided at the bottom of this page about Isotrex. Like all medicines, Isotrex Gel can cause Side Effects, although not everybody gets them. severe burning, peeling, redness or itching of your skin. Stop using Isotrex and see a doctor straight away, if you notice any of the Side Effects above – you may need urgent medical treatment. Redness or peeling of your skin, especially during the first few weeks of use. Slight stinging or skin pain. Darkening or lightening of skin. You have ever had an allergic reaction to isotretinoin or any of the ingredients listed in the patient information leaflet. If you or any of your close family have had skin cancer. You are using any other medicines for acne. You may need to use the two products at different times of the day (eg. one in the morning and the other at bedtime). 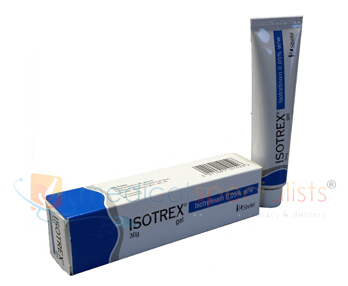 You cannot tolerate or have skin reactions in sunlight to isotretinoin or any of the other ingredients of Isotrex Gel. You suffer from eczema,redness of the skin, broken blood vessels and tiny pimples usually on the central area of the face (rosacea) or redness and soreness around the mouth (perioral dermatitis). Isotrex Gel may further irritate these conditions.